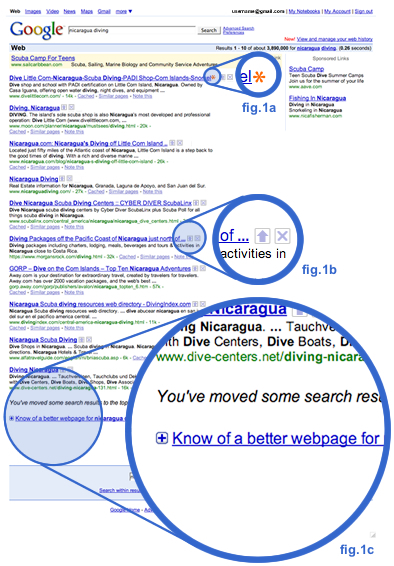 Google’s changes to their Search Engine Results Pages (SERPS) let you change the order of your search results. I’m so excited I could breathe. How often do you re-do a search? Those searches would be a very small fraction of my total searches so why would I invest the time removing rogue sites and re-ordering the results? Unless Google plans to take into account my re-ordering, frankly my dear, I don’t give a damn. Perhaps Google hopes that by aggregating the re-ordering they can assemble more useful SERPS but I doubt even that would work. The people with the vested interest in shifting results are black hat SEO operators, ie the baddies, so I doubt Google will pay any attention to the re-ordering. They are allowing you to view what other people say about sites and their re-ordering of them and that is a step towards what I’ve described as a next generation search engine. But it’s a very small step. Would be nice to see third party comments on a site if people bother to annotate. But what’s in it for them? Listening to Bruce Clay and Matt Cutts discussing the future of Google, the key trends are increased personalisation and localisation of search results. In other words, Google will know where you are, so it will automatically give you the local laundromats if you type in ‘laundromat’. And it will profile your searches (and perhaps your gmail) to help deliver results that match your own particular twisted personality. Bruce’s claim that ‘ranking is dead’ is just headline-seeking. There will still be benefits in localising your pages and optimising them for your target market, it’s just that it will be a bit harder to prove to a client that you’ve done the job right, because there won’t be a single overall search result page. But as Cutts points out, this is already the case. Australian sites produce Australian pages and so on. The move towards intent-based search and local search are logical extensions for Google. The only people entitled to panic are the companies trying to flog local search directories. That would include Yellow Pages. The interesting thing for me in Clay’s talk was the notion of Google interrogating audio/video files and weighting search results towards sites providing video content, what he calls ‘engagement objects’. I suspect that process is fraught with technical difficulties but it makes a lot of sense for Google to go down that path. If you’re not currently doing video on your site, go buy a green screen. I do agree with Clay and Cutts that people offering SEO services will need to broaden their service offering; the future is not just about ranking, it’s about (1) an effective reach and (2) an effective web presence when they find you. I’m quite happy about that trend, it’s what I already do for clients. I would like a search result that stays away from video. Video online still crap, and unlike stills, ties you to the spot for a specific time. I almost never click on a video link when non video is available.